House prices continued to rise in Q1 but the rate of increase has moderated according to the latest house price survey from MyHome.ie. The survey found that the national mix adjusted asking price measure rose by 2.2%, in the first three months – up 5.7% year on year – while in Dublin asking prices were up 2.5% and 12.7% respectively. According to the survey the mix adjusted asking price for a house nationally is €198K while in Dublin its €276K. 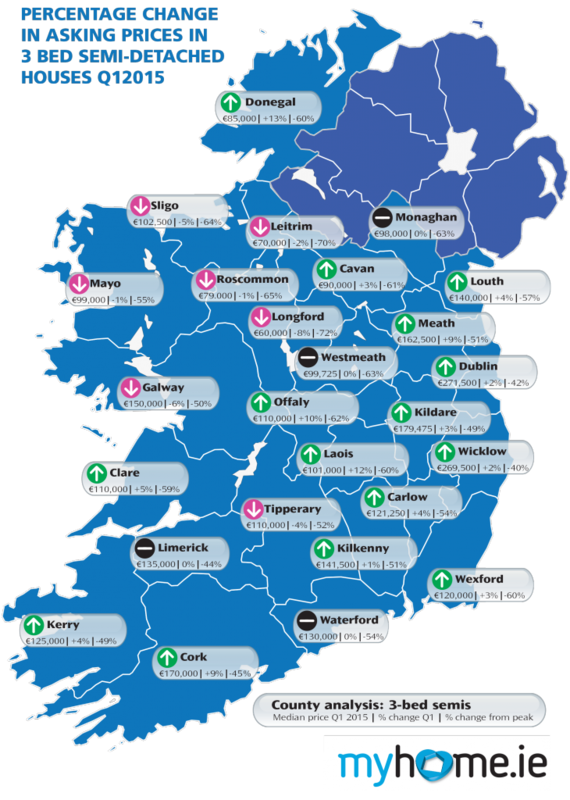 For new instructions the median price in Dublin has risen 1.4% in Q1 to €299K while outside Dublin the figure has risen 6.3% to €169K. The author of the report, economist Conall MacCoille from Davy, said the moderation in house price inflation was a positive development and did not mark a period of sustained declines. A mix of factors probably explains the recent moderation in house price growth. First of all affordability was becoming stretched in Dublin. Secondly the Central Bank’s new lending rules may have reined in exuberant price expectations. Thirdly the end of capital gains tax exemptions may have inflated demand mid-year, leading to price falls towards the end of last year. Our affordability index shows that house price to income ratio is highest in Dublin and Mid Leinster at 5.9 and 4.9 respectively while the midlands at 2.8 and the mid-west at 3.4 looks most affordable (Full table in Note to Editor). The figure for the state as a whole is 5 and although Irish property prices are still well below 2007 peak levels, they no longer look cheap relative to incomes he said. MacCoille believes population increases and supply constraints will support prices. Housing completions were just 11,000 in 2014, less than half of the estimated natural demographic requirement of 25,000 per annum. A worrying development is the collapse in the Irish construction PMI survey earlier this year and anecdotal evidence which suggests that few additional new projects are coming on stream. The lack of new supply and population growth will help support prices particularly in urban areas such as Dublin. However the flip side of this coin is that the lack of home building will not just hold back first time buyers, but also banks’ profitability and ability to lend, employment in the construction sector and potentially Ireland’s attractiveness for foreign direct investment MacCoille concluded. Angela Keegan from MyHome.ie said the latest transaction data shows a significant increase in the first two months of the year. The impact of the new lending rules will only become apparent in the second half of the year. At this point we believe the moderate growth which was evident in Q1 will continue and we believe this is positive for the longer term sustainability of the market Keegan concluded.